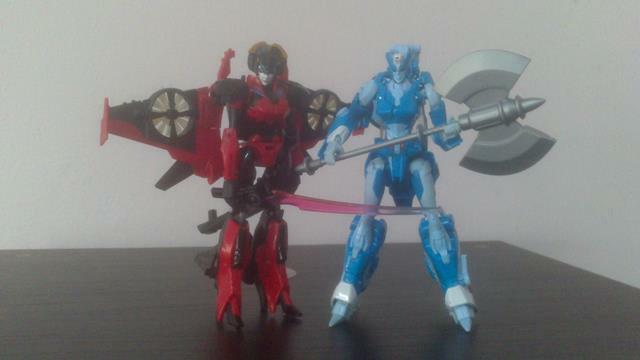 It is said that it�s only natural for Windblade to join the Autobot army. Although she is an outsider, her unique and lovely appearance and brilliant sword plays are fascinated by others. Windblade has never met anyone who refuses her friendship. She for some reason has a special ability to link up with Metroplex. Her true power along with her origin is shrouded with mystery. Windblade is one of my favorite fembot because I helped design her (along with the rest of the transformer fandom) and Hasbro bring her to life with her own series, although she was introduced in Dark Cybertron, she was merely a cameo in there along with Chromia and Arcee. 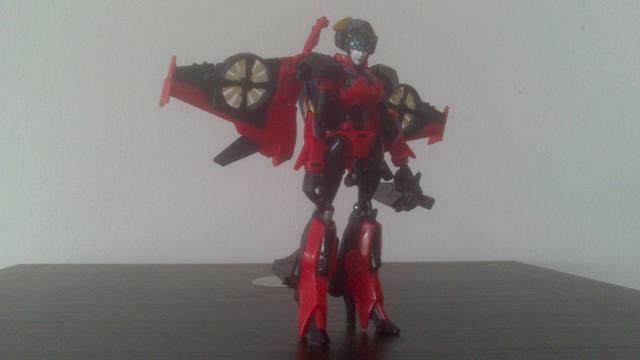 She has truly come to life with Windblade series. I recommend everyone to read it because her relationship with Chromia is fun to read. So the comic open with a mysterious figure standing on top of a building dress in kimono laughing typically in an evil manner. Well, who else, it�s Windblade, where in the world she found a kimono that would fit her is beyond me, I just roll with it. She proclaims that the day of destruction of their world has arrived while still laughing evilly. Angrily Rattrap demand that mysterious person that look like a Japanese doll to reveal her identity, apparently Waspinator thinks she is an alien robot from a TV series that he watches. Windblade pissed off by both Rattrap and Waspinator, throw away her kimono, jump down while brandishing her sword, introduced herself as Zika�s second little sister. Well to be fair, you do look like a Japanese doll with that kimono on. Tigatron disbelief that Windblade refer herself as "little sister", look like someone has a death wish. Windblade further explained that their world is now belongs to Zika in a typical villain monologue. Beast Megatron wondering why this is turning into a TV show and Waspinator are talking nonsense. Rattrap is confused by Waspinator and Optimus Primal is just as confused as Megatron. Megatron tries to get Waspinator to stop with his nonsense. Windblade ending her typical villain monologue with a typical �Have a taste of my power� line and transform into her ALT mode and lay waste to the place. Optimus Primal, Cheetor, Tigatron and Arcee are watching helplessly (Aunt Arcee, why aren�t you doing anything?) while Rattrap call upon the protector of the world, the giant transformer, Metroplex. Metroplex appeared from a space bridge, grabbing Windblade, defeating her. Apparently Windblade have been programmed to have her memory wiped out upon defeat, so she has no idea what's happening while Rattrap and Cheetor are celebrating her defeat. It feels like this comic is a parody of the Tokusatsu genre, more accurately the superhero genre like Ultraman, Super Sentai, Kamen Rider and Metal Hero. If you asked me, they should have saved the joke for Superion since he as a combiner would fit in more to the parody. Anyway�. 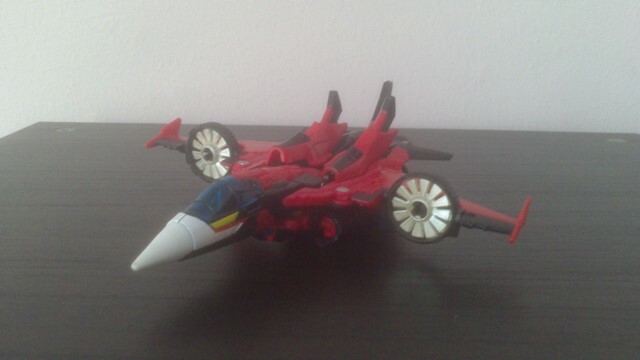 This is a repaint of the Hasbro's Windblade, so she is still a VTOL jet, In jet mode, she is mainly red with black highlight with some white on the nose cone with a bit of yellow. She also has clear dark blue for the cockpit. She is the reversed colored of the Hasbro version which separate her from the Hasbro version which is mainly black with red highlight. Additional to that, she is pretty accurate to how she looks in the comic when come to color scheme down to the yellow pattern on the nose cone. However, unlike the Hasbro version where the legs stand out like a sore thumb, because she is mainly red, the legs blends in well, fixing one of the Windblade many flaws. Takara also fixes some of the pegs so the ALT mode has no problem holding itself together, another flaw of Windblade has been eliminated. 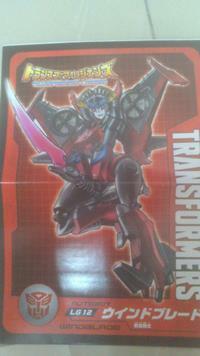 But that pretty much all Takara can do for Windblade without redesigning the whole figure. So the empty center of the plane is still present, the typical robot under the jet is still present. Overall, the ALT mode looks great with the new color scheme, it held itself well and the most important is, it looks dramatically differ than the Hasbro version. Another job well done by Takara. 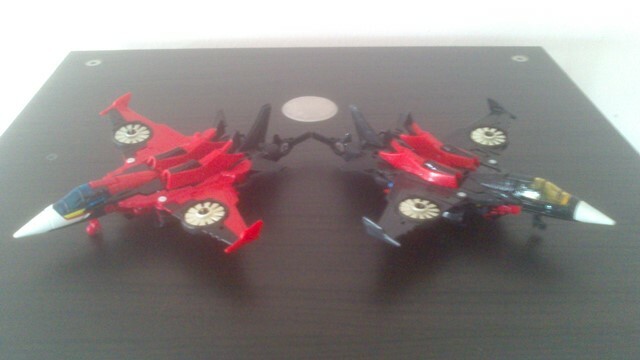 Transforming to robot mode is the same, nothing changed here, so it�s quite complicated, unique and fun. In robot mode, like her ALT mode, she is mainly red with black highlight, with some blue and gold here and there, so she looks quite similar to the Hasbro version. The only differ between both versions is the placement of the red, and some minor changes in the placement of the black and the blue. The red on the wings and the crotch area result in a much more uniform pattern which improve the overall appearance of the figure. For some reason, I expect Takara to give us a much more adorable head, but nope, but they did change the paint on the head, from silver to white and give her a much accurate Camien face paint, replace the majority of the gold to metallic blue and give her a much more prominent lipstick. She did not look more adorable, but she did look accurate to how she looks in the comic. Also the gold on the comb are fully painted. For articulation, her head can look up and down., slightly left and right.. Her head and collar design severely limit her head articulation. Her arm can rotate 180 degrees, her gigantic wing prevents her arm from moving all the way, outward movement of 90 degrees, rotate on the bicep, bend 90 degrees on the elbow and rotation on the wrist. Her leg can move backward 90 degrees, forward 90 degrees, full 180 degree split, rotate at the thigh and bend at the knee for 90 degrees, no limitation from the giant wings. She also has a waist rotation from the transformation. Her wings can move up and down and swing back and fore. 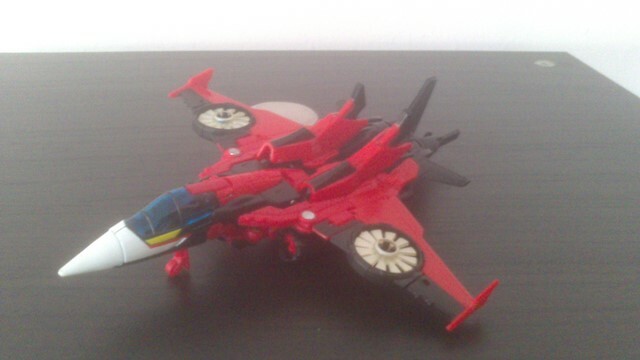 Like the ALT mode, Takara fixes one of the many flaws of Windblade. They give the wings a tighter joint so her wings no longer move when you mess with her arms and that is the only thing they fix. I wish they would also tighten her heels so it would not collapse as easily. So because they did not fix the heels, like the Hasbro version, she has problems standing as the result of having a high heels and being top heavy. For weapon, she comes with her energon sword and a sheath, which can be held, attach to the legs in robot mode or under the jet in ALT mode. But be caution when sheathing and unsheathing the sword, it fits in very tight, it is done one purpose for some reason since it appears to is has some kind of lubrication in the sheath, making the sword oily. Another changes are the sword now in clear red instead of purple. Overall, I love this version of Windblade, Hasbro version is good, but this is better, it looks much better and accurate to the appearance on the comic. However the Hasbro version is also accurate to the comic, but to Dark Cybertron�s Windblade while this version is accurate to Windblade�s Windblade. Transformation Design: 3.5, transformation to robot mode is fairly complicated but easy to learn, however, transformation back to jet mode isn't as easy, it took me a while to figure out and the instruction doesn't help much. But once you learn it, its fun. Durability: 7, nothing fall out, but some of the joints is a bit too tight and the sword will break when sheathed incorrectly, so be caution when playing with the sword. Fun: 7, her vehicle mode does more than the other jet transformer, her robot mode has a lot of replay value and the transformation is fun once you learn it. 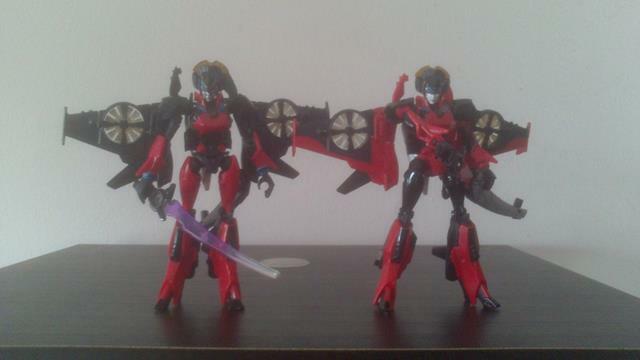 Aesthetics: 8, quite accurate to the Windblade comic in both ALT and robot mode. Articulation: 7, a lot of articulation, but some are limited thanks to the design, but it's not like you can't pull a dynamic pose, it's just more difficult. Value/Price: 3.5, Transformer Legends line is still new, but it�s an import figure, so the price is slightly higher the normal. Overall: 8, Well Takara did a great job on Windblade, they fix some of the issues, and give her a much more comic accurate appearance. If you like Windblade, get this even if you already have the Hasbro version, you will not regret it. If you don�t like Windblade, I would still recommend this to you because this is the improved version of something we, the transformer fans help create. Plus, I can't think of any reason not to add her into your collection.